18.10.18 16:43 Transfer Sent Payment: 150.00 USD to account U18800343 from U1294xxx. Batch: 232610974. Memo: Shopping Cart Payment. 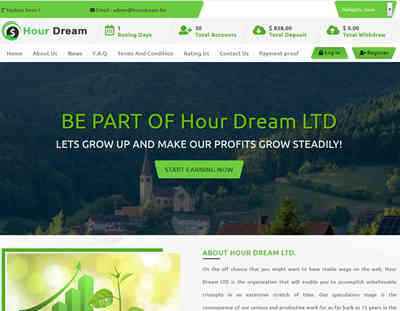 Deposit to Hour Dream LTD User allhyips. 19.10.18 09:19;Account;Receive;Received Payment 1.26 USD from account U18800343 to account U1294000. Batch: 232671752. Memo: API Payment. Withdraw to allhyips from Hour Dream LTD.
20.10.18 10:27;Account;Receive;Received Payment 3.01 USD from account U18800343 to account U1294000. Batch: 232792099. Memo: API Payment. Withdraw to allhyips from Hour Dream LTD.
19.10.18 20:20;Account;Receive;Received Payment 2.47 USD from account U18800343 to account U1294000. Batch: 232743085. Memo: API Payment. Withdraw to allhyips from Hour Dream LTD.
21.10.18 19:02;Account;Receive;Received Payment 0.63 USD from account U18800343 to account U1294000. Batch: 232931032. Memo: API Payment. Withdraw to allhyips from Hour Dream LTD.
21.10.18 12:31;Account;Receive;Received Payment 5.38 USD from account U18800343 to account U1294000. Batch: 232894987. Memo: API Payment. Withdraw to allhyips from Hour Dream LTD.
20.10.18 19:00;Account;Receive;Received Payment 2.56 USD from account U18800343 to account U1294000. Batch: 232837506. Memo: API Payment. Withdraw to allhyips from Hour Dream LTD.
23.10.18 20:41;Account;Receive;Received Payment 1.25 USD from account U18800343 to account U1294000. Batch: 233185353. Memo: API Payment. Withdraw to allhyips from Hour Dream LTD.
23.10.18 09:49;Account;Receive;Received Payment 3.76 USD from account U18800343 to account U1294000. Batch: 233106285. Memo: API Payment. Withdraw to allhyips from Hour Dream LTD.
24.10.18 19:46;Account;Receive;Received Payment 2.03 USD from account U18800343 to account U1294000. Batch: 233302692. Memo: API Payment. Withdraw to allhyips from Hour Dream LTD.
24.10.18 09:44;Account;Receive;Received Payment 2.14 USD from account U18800343 to account U1294000. Batch: 233231505. Memo: API Payment. Withdraw to allhyips from Hour Dream LTD.
29.10.18 05:17;Account;Receive;Received Payment 1.34 USD from account U18800343 to account U1294000. Batch: 233730182. Memo: API Payment. Withdraw to allhyips from Hour Dream LTD.
28.10.18 18:21;Account;Receive;Received Payment 2.82 USD from account U18800343 to account U1294000. Batch: 233698439. Memo: API Payment. Withdraw to allhyips from Hour Dream LTD.
28.10.18 05:08;Account;Receive;Received Payment 2.74 USD from account U18800343 to account U1294000. Batch: 233636669. Memo: API Payment. Withdraw to allhyips from Hour Dream LTD.
30.10.18 09:45;Account;Receive;Received Payment 3.21 USD from account U18800343 to account U1294000. Batch: 233867911. Memo: API Payment. Withdraw to allhyips from Hour Dream LTD.
29.10.18 19:07;Account;Receive;Received Payment 2.9 USD from account U18800343 to account U1294000. Batch: 233813639. Memo: API Payment. Withdraw to allhyips from Hour Dream LTD.
31.10.18 05:17;Account;Receive;Received Payment 2.21 USD from account U18800343 to account U1294000. Batch: 233954372. Memo: API Payment. Withdraw to allhyips from Hour Dream LTD.
30.10.18 18:33;Account;Receive;Received Payment 1.07 USD from account U18800343 to account U1294000. Batch: 233924535. Memo: API Payment. Withdraw to allhyips from Hour Dream LTD.
01.11.18 10:09;Account;Receive;Received Payment 3.58 USD from account U18800343 to account U1294000. Batch: 234427491. Memo: API Payment. Withdraw to allhyips from Hour Dream LTD.
31.10.18 18:25;Account;Receive;Received Payment 1.52 USD from account U18800343 to account U1294000. Batch: 234035671. Memo: API Payment. Withdraw to allhyips from Hour Dream LTD.